Places to see at Sikip: Sikip is famous for its wonderful natural surrounding. So, you will definitely have a good time savoring the amazing sites of nature. Nearby attractions from Sikip: Among the nearby attractions, you can definitely visit Jorethang, another great place for its exquisite nature. You would also see a lovely bridge over River Rangeet at Sikip. Samdruptse, Temi Tea Garden, Ravangla, Borong and Namchi other attraction within a few hours drive from Sikip. Things to do in Sikip: Sikip offers great opportunities for rafters and anglers in the waters of Rangeet River. The unstable waters of Rangeet River are perfect for rafting from Sikip-Jorethang-Majitar-Melli. Besides, you can also camp on the banks of the river. How to reach Sikip: You can reach Sikip from Gangtok via the Legship on a motorable road in some 5 hours. 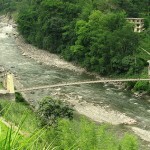 You can also hire a car and reach the place from Darjeeling and Siliguri via Jorethang. Best time to visit Sikip: You can visit Sikip during any time of the year. However, if you want to make the most of rafting opportunities, then the months of March to May and October to December is the best time. Lodging and dining facilities at Sikip: Presently Sikip does not offer any hotels for stay. If you want accommodation at Sikip then you can avail some home stays here which also offer moderate dining facilities as well. Hey, the Rangeet River Expedition starts from Sikip to Nayabazar and then after halting at Nayabazar you can raft from Nayabazar to Melli.